Each member of the Society of African Missions makes his own contribution to the Mission of the Church. Each life is unique. We list here brief life stories of those SMA missionaries who died in the period June 2005 – August 2008. We do so in order to present part of the SMA story, a story of service and dedication to Africa and her peoples that can really never be fully told. The more recent Obituaries can be accessed here. Fr Dominic Kearns SMA passed away peacefully at St Theresa’s Nursing Unit attached to the SMA House, Blackrock Road, Cork in the afternoon of 7 April 2008. He was aged 83 years and had been ill for some time but his condition had deteriorated rapidly over the past few weeks. Dominic was born on 13 May 1924 in Knockadalteen, Ballymote, Co Sligo in the Diocese of Achonry, the only child of the late Martin and Annie Agnes (nee Scanlon) Kearns. After his primary schooling at Carrigans, Ballymote he attended Coláiste Mhuire, Douglas, Cork, the Juniorate of the Presentation Brothers, for his secondary education. Two great influences on his life and education were schoolteacher Tom McGettrick and Brother Aengus of the Presentation Brothers. He decided to become a priest and joined the Society of African Missions coming first to the Society’s House at Cloughballymore, Kilcolgan, Co Galway in 1944-1946 for spiritual and philosphy studies and in 1946-1950 to study theology at SMA House, Dromantine, Newry, Co Down. He became a permanent member of SMA on 12 June 1949. He was ordained priest for the Society of African Missions at St Colman’s Cathedral, Newry, Co Down on 14 June 1950. He retired from Africa in 2001 and then took up an appointment in the Archdicoese of Boston in St Gregory’s Parish, Dorchester, Massachusetts in USA, where he worked until 2004. In 2004 he moved into the SMA House at Claregalway, Co Galway but after six months there due to ill-health he transferred to SMA House, Blackrock Road, Cork. He is sadly mourned by his cousins, many dear friends and confreres in the SMA. His remains were removed from the SMA House Oratory, Blackrock Road, Cork to the nearby St Joseph’s SMA Parish Church, Blackrock Road, Cork on Tuesday, 8 April. The funeral Mass was concelebrated at St Joseph’s Parish Church, Blackrock Road, Cork on Wednesday, 9 April. Fr Damian Bresnahan SMA, Provincial Councillor, was the main concelebrant and preached the homily. He was assisted by Frs Joe Maguire SMA and Frank Meehan SMA who served for many years alongside Dominic in Jos and almost forty SMA priests. The MC was Fr Colum O’Shea SMA and Fr Lee Cahill SMA was at the organ. The soloist was Dominic’s cousin, Ray. Present were Sisters of Our Lady of Apostles, many of whom worked with Dominic in Jos, and Mercy Sisters as well as people who worked in Jos over the years when Dominic was there. Interment followed at the SMA Community Cemetery, Wilton, Cork. Fr Connie Griffin SMA passed away unexpectedly in Abuja, Nigeria, in the afternoon of Monday, 19 November, 2007. He was being treated for malaria for a few days before taking a turn for the worst and died in hospital in Abuja. He was 60 years of age. Connie was a native of West Colla, Schull, Co Cork where he was born on 1 September 1947. He received his primary education in Schull and his secondary education at Farranferris College, Cork. He came to SMA House at Cloughballymore, Co Galway for a Spiritual Year in 1967. He became a temporary member of the Society of African Missions in 1968 and a permanent member on 22 April 1973. He studied philosphy at SMA House, Dromantine and for theology was based at SMA House, Maynooth. He was ordained priest on 15 June 1974 at the Church of the Real Presence, Curraheen Road, Bishopstown, Cork, by the late Bishop Cornelius Lucey. In 1975 he was assigned to missionary work in Nigeria where he spent his entire missionary career. He worked in the Archdiocese of Kaduna 1975-1996 and 2005-2007. From 1996-2005 he was based at Kagoro in the neighbouring Kafanchan Diocese. He was predeceased by his brother, Michael, and sister, Ellen. He is sadly mourned by his sister, Margaret, and his brother, Anthony, and many relatives and friends in West Cork, by his parishioners in Kurmin Sara and Kagoro Parishes and by his brothers in the SMA. His funeral took place in Nigeria. On Sunday 25 November his remains were removed from the mortuary at Abuja (the capital of Nigeria) after a simple ceremony attended by priests, sisters and parishioners from his parish of Kurmin Sara who had come “to accompany him home”. En route to Kaduna the cortege stopped at Kurmin Sara where a prayer service was held and some parishioners had the opportunity to make short speeches. The parishioners were joined by people from other parishes where Connie had ministered – Kagoro, Gidan Bako and Sabon Saraki. The cortege arrived at Kaduna at 6.00 p.m. and the remains were received at St Peter’s Church, Sabon Tasha, on the outskirts of the city by parish priest, Fr Daniel O’Brien SMA. A vigil was held in the church beginning with Mass concelebrated by about 40 priests at which Dan O’Brien preached the homily. The vigil continued until midnight. The funeral Mass was concelebrated on Monday, 26 November. The Archbishop of Kaduna, Most Reverend Peter Jatau presided and SMA Regional Superior, Fr Maurice Henry, was the main concelebrant and he was assisted at the altar by Fr Richard Angolio SMA and Fr John Dunne SMA, Vice-provincial of the Irish Province. Fr John Haverty SMA preached the homily. More than 70 priests concelebrated – diocesan, religious and SMA including nine SMA who travelled from the Nigeria SMA South Region. The huge attendance included sisters from various congregations – OLA, OLF, SSL, IJ, HCJ. At the end of the Mass Archbishop Jatau spoke about “his friend, Connie” while Maurice Henry described Connie’s illness that led to his death. John Dunne read the letter of condolence from the President of Ireland, Mary McAleese. The Irish Ambassador, Kyle O’Sullivan, paid tribute to Connie and to all Irish missionaries. Following the Prayers of Commendation the funeral cortege headed off on the long journey to Kagoro. The remains were received in Kagoro by the Bishop of the local diocese of Kafanchan, Most Reverend Joseph Babogiri and the Bishop of Bauchi, Most Reverend John Moore SMA and a huge crowd which had gathered and which included about 100 diocesan and SMA priests, sisters and a large group of SMA supporters. Fr Raymond Hickey OSA represented the Apostlic Nuncio. Following some words from Bishop Babogiri, Maurice Henry and Fr Edward Bako, Head Chaplain of the Nigerian Armed Forces, Connie was laid to rest in the SMA plot at at the cemetery in the SMA compound at Kagoro. Fr Francis (Frank) McCabe SMA passed away peacefully in the afternoon of 4 September at St Theresa’s Nursing Unit, SMA House, Blackrock Road, Cork. He was in his ninetieth year. Frank was born into a family of two sisters and five brothers in Derrinasoo, Derreenargon, Boyle, Co Roscommon in the Diocese of Elphin on 24 May 1918. He attended Corderay National School before coming to the Sacred Heart College, Ballinafad, Co Mayo for his secondary education with the SMA. In 1941 he came to the SMA Novitiate at Cloughballymore, Kilcolgan, Co Galway and there graduated with BA at UCG. He became a permanent member of the Society of African Missions on 14 June 1946 and was ordained to the priesthood on 13 June 1947. He celebrated his first Mass at the church in Drumboylan. In June 2007 he celebrated the Diamond Jubilee of his ordination. In 1948 he was sent on missionary assignment to the then Vicariate of Lagos in Nigeria and was appointed to Ibadan. That territory was subsequently divided and in 1952 the Prefecture Apostolic of Ibadan was created becoming the Diocese of Ibadan in 1958 with Bishop Richard Finn SMA the first bishop of the diocese. Frank spent the nearly twenty years teaching. For some time he was on the staff of Oke-Are Minor Seminary in Ibadan city, where among his pupils were more than seven of the present bishops of Nigeria. In 1954 he founded Fatima College, Ikire and was its first principal. He began pastoral ministry in Eleta parish in Ibadan city and in 1968 he moved to Igbora Parish, a rural area between Ibadan and Abeokuta. There was a huge underveloped farm settlement in the parish and Frank procured funds from overseas agencies, funds which he used to buy tractors, trailers and ploughs. He then mobilised the local work force to till huge tracts of land where tobacco and maize were planted. For almost twenty years he continued to motivate and encourage this development. He was then assigned to Moor Plantation a parish in the suburbs of Ibadan. In 1989 ill-health forced him to return to Ireland and he took up an appointment in Killimordaly Parish in Clonfert Diocese where he spent six years before retiring to SMA House, Claregalway. In 1996 he moved to SMA House, Wilton, Cork and returned to Claregalway in 1997. In 1998-2004 he went to Australia, before retiring in poor health to Blackrock Road in 2004. His health declined steadily over the recent years until he slipped away to God quietly on Wednesday. His remains were removed from the SMA Chapel, Blackrock Road, Cork following the 10.30 a.m Community Mass on Thursday 6 September to St Joseph’s SMA Parish Church, Wilton, Cork, where the funeral Mass was held at 12 noon. Bishop John Kirby of Clonfert led the Mass which was concelebrated by a large number of SMA priests and a representative of St Patrick’s Missionary Society. The Provincial leader, Fr Fachtna O’Driscoll SMA preached the homily and led the obsequies in the Church and in the adjoining SMA community cemetery where the burial took place. The funeral was attended by Frank’s many nieces and nephews and other relatives as well as people from Attymon where he had served. Nieces and nephews played an active role in the funeral liturgy. Fr Bernard (Brian) Horan SMA passed away suddenly on the morning of 12 April at the Parochial House in Kilteevan, Co Roscommon, in the parish of Roscommon in the Diocese of Elphin, where he has served as Curate for the past four years. He was in his usual good health up to Thursday evening so his passing comes as a great shock to his family, the parishioners and the Society of African Missions. Brian was born on 3 May 1935 in Brougher, Ballinafad, Co Sligo, in the Diocese of Achonry. He was the elder of the two sons of Bernard and Bridget (nee Dignan) Horan. He attended the local Carrowcrory National School before going to the Sacred Heart College, Ballinafad, Co Mayo, the then Juniorate of the SMA for his secondary education. On deciding to become a missionary he joined the Society of African Missions undergoing the Spiritual Year at the Society’s House at Cloughballymore, Kilcolgan, Co Galway in 1954-1955. He spent 1955-1956 studying at SMA House, Wilton, Cork and transferred to the SMA Major Seminary at Dromantine, Newry, Co Down in 1956 and there completed his philosophy and theology studies in 1961. He took temporary membership of the SMA in June 1955 and became a permanent member on 14 June 1960. On 21 December 1960 he was ordained to the priesthood at St Colman’s Cathedral, Newry by the late bishop, Most Rev Eugene O’Doherty. Brian spent over forty years on missionary assignment in the Archdiocese of Kaduna in Nigeria from 1961 until 2002, apart from six months when he was standing in as Director of Students of the Spiritual Year at Cloughballymore in 1965. He served in various parishes in the Archdiocese. In latter years he was appointed the Archdiocesan Procurator and Parish Priest of St John’s Church in Kaduna city. In 2002-2003 he took a sabbatical break and in 2003 took up assignment in the Diocese of Elphin as curate in Kilteevan and chaplain at the Sacred Heart Hospital, Roscommon. He is survived by his brother, Patrick and a small number of relatives. 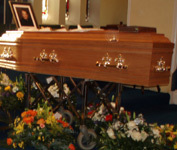 Following Mass at the Sacred Heart Home, Roscommon on Friday, 13 April Brian’s remains were removed to St Joseph’s Church, Kilteevan. Mass was celebrated in the Church on Saturday, 14 April and this was followed by removal to St Joseph’s SMA Parish Church, Wilton, Cork. The Funeral Mass was concelebrated in Wilton on Monday, 16 April and was followed by interment in the adjoining community cemetery. The main celebrant of the Mass was Fr Seamus Nohilly, who preached the homily. He was assisted at the altar by Frs Terry Gunn and Eddie Deeney (classmates), Eddie O’Connor (missionary in Kaduna) and Martin Costello (Vice-Superior, SMA House Claregalway). The concelebrants included a representative from St Patrick’s Missionary Society and from the Order of St Augustine (which have missions in Nigeria) and a large number of SMA confreres. Many OLA and SSL sisters attended as did a representative of the Mercy Sisters. The SMA Parish choir provided the singing with Brother Jim Redmond SMA at the organ and the congregations inging was led by Fr Cormac Breathnach SMA. Fr Denis Collins SMA was Master of Ceremonies. Fr Peter “Doc” Devine SMA passed away in Daisy Hill Hospital, Newry Co Down, in the evening of 23 March. He had been in failing health or some time and had needed a dialysis machine in latter months. Peter was from Molleek, Tullyallen, Co Louth where he was born of 8 September 1933. He received his primary education at the local primary school and later at CBS, Droheda. Feeling called to become a missionary he came to the SMA for his secondary education at Sacred Heart College, Ballinafad, Co Mayo. In 1953 he undertook the Spiritual Year at Cloughballymore, Kilcolgan (Co Galway) and in 1954 began studies at UCC for which he was based at the SMA House, Wilton, Cork. He graduated in 1957 and commenced theology studies in the SMA Seminary at Dromantine, Newry 1957-1961. He was ordained priest on 21 December 1960 at St Colman’s Cathedral, Newry by the late Bishop Eugene O’Doherty. In 1961 he was appointed to work in the Archdiocese of Kaduna in Nigeria and worked there continuously until 1984, mostly in education as class teacher, school principal and Zonal Education officer. He was forced through ill-health to take up assignments in Ireland. He was first based in Wilton as Bursar until 1987 and then took up residence in Dromantine where he took personal pride in the development and care of the grounds. He was renowned for his mechanical abilities which stood him well both in Africa and in his assignments in Ireland. A keen sportman he was noted for his interest in greyhounds and in point-to-point races. Peter is survived by his brothers, Bernard and Patrick and his sister-in-law, Norah, who sadly mourn his passing, as do his nieces and nephews and other relatives and friends. His remains were removed from the SMA House Chapel at Dromantine, Newry after Community Mass on Sunday 25 March to the Mellifont Parish Church at Tullyallen, Drogheda, Co Louth. The concelebrated funeral Mass was be on Monday 26 March. Bishop Gerard Clifford, Auxiliary Bishop of Armagh, presided and led the prayers in the priests’ cemetery adjoining the church. Fr Fachtna O’Driscoll SMA, Provincial Superior, was the main concelebrant of the Mass and preached the homily. Tullyallen parish priest, Fr Laurence Caraher led the prayers of Final Commendation. More than twenty priests from the Archdiocese of Armagh, the Diocese of Dromore and SMA joined in concelebrating the Mass. Fr John McCreanor SMA passed away peacefully in his sleep at St Theresa’s Nursing Unit, Blackrock Road, Cork in the morning of 27 February 2007. John had been in poor health in recent years and had celebrated his 87th birthday two weeks ago. John was born on 13 February 1920, the eighth of nine children of Thomas and Alice (nee Rogan) McCreanor, in Ballinahich, Co Down. He received his primary education at Drumaness, Ballinahinch and his secondary education at the Commercial Technical School, Ballinahinch and at Sacred Heart College, Ballinafad, Co Mayo. One of his sisters, Kathleen (Sr Eunan), joined the Missionary Sisters of the Assumption and served in Grahamstown, South Africa and she was to have a profound influence on John’s choosing to become a missionary. The life of Fr Eamon Murphy SMA in the African Missionary and the influence of family friend, Fr Bill Fegan SMA, motivated John to join the SMA. He studied at the SMA houses in Cloughballymore, Co Galway and Dromantine, Newry, Co Down and became a permanent member of the Society on 12 June 1949 and was ordained priest on 14 June 1950 at St Colman’s Cathderal, Newry. His first missionary assignment was to Lagos, Nigeria which he reached in December 1950 and there he learned the Yoruba language under the tutelage of Fr Harry Shepherd SMA. In 1951 he was assigned to Ibadan and served in the parishes of Ogunpa, Oke-Offa and Oke-Ado. In 1956 he became involved in the schools building programme for Bishop Richard Finn of Ibadan. This work was interrupted for a spell in Ghana on a Community Development course organised by UNESCO. In 1959 he was posted to England to help in the building up of the British Province of SMA. He continued, for over forty years, to work for the British Province until he was forced to retire due to ill-health in 2003. He has been at St Theresa’s Nursing Unit, Blackrock Road, Cork since. John is sadly mourned by his sister-in-law, Maureen, and many nephews, nieces and other relatives and friends. His remains were removed from the Community Chapel, Blackrock Road following concelebrated Mass on Wednesday 28 February to the Parish Church, Ballinahinch, Co Down. The Funeral Mass will be concelebrated on Thursday, 1 March at 2.00 pm and will be followed by interment in the adjoining cemetery. Fr Christopher (Chris) Murphy SMA passed away peacefully after a long illness at St Theresa’s Nursing Unit, Blackrock Road, Cork in the late evening of 30 January 2007. Chris was born on Christmas Day 1918 and recently celebrated his 88th birthday. Chris was born in Mullagh, Co Cavan in the diocese of Kilmore. His family later moved to Moynalty, Kells, Co Meath. He was the youngest of nine children, four girls and five boys. He was brother of the late Sr Celine, Sister of the Sacred Hearts of Jesus and Mary. He completed his early education at Mullagh National School and Kells CBS and finished hus secoindary schooling at the SMA Sacred Heart College, Ballinafad, Co Mayo. He was stirred to become a missionary by a picture in a missionary magazine of a white-bearded missionary moving down a river in a boat. He studied at the SMA houses at Cloughballymore, Co Galway and Dromantine in Co Down. He became a member of the Society of African Missions on 1st july 1941 and was ordained priest on 17 December 1944 in St Colman’s Cathedral, Newry. His first missionary appointment was to Nigeria where he arrived in June 1946 and where he spent more than 40 years. From 1946-1958 he ministered in the Prefecture of Kaduna which became the Diocese of Kaduna in 1956. He was appointed as Superior of SMA House, Wilton from 1958-1961. From 1961-1974 he again ministered in Kaduna which had become an Archdiocese in 1959. In 1974 he was elected Regional Superior of SMA in Northern Nigeria and was based at Kagoro. He returned to ministry in the Archdiocese of Kaduna from 1979-1987. In 1987 he moved back to Kagoro as Guestmaster at the SMA Regional House. In 1992 ill-health forced him to retire and leave Nigeria. He took up residence at Blackrock Road until he moved to Wilton in 1996. In 2005 he returned to Blackrock Road due to failing health. His remains reposed at the SMA Chapel, Blackrock Road before removal to the SMA St Joseph’s Parish Church, Wilton on 1st February. The concelebrated Funeral Mass took place on Friday, 2nd Febraury in Wilton and was followed by interment in the adjoining SMA Community Cemetery. Fr Fachtna O’Driscoll SMA, Provincial Superior, was the principal celebrant and preached the homily. Fr David (Davey) Hughes SMA died peacefully at St Theresa’s Nursing Unit, Blackrock Road,Cork on the morning of Saturday, 13 January 2007. He had been unwell for some time and his condition deteriorated rapidly over the few days before his passing. David was born on 7 April 1917 in Cabinteely, Co Dublin. He was one of three daughters and two sons of David and Marie Hughes. He received his early education with the Irish Sisters of Charity at Milltown and completed his secondary education with the Christian Brothers, Synge Street, Dublin. Having decided to become a missionary he became a permanent member of the Society of African Missions on 15 June 1940 and was ordained to the priesthood on 22 December 1940. In January 1942 he began his active missionary apostolate with assignment to Egypt where he taught in St George’s College. David spent sixteen years there. In 1958 he was reassigned to minister in the Archdiocese of Kaduna, Nigeria. He continued to work ther until 1977. He then took up an appointment in the Diocese of Aberdeen in Scotland and worked there until 1988. A heart condition forced him to take on a less active ministry and in 1988 he took up chaplaincy work at Cleethorpes in the Diocese of Nottingham in England. Advancing age forced his retirement in 1993 and he then spent some time in the Society’s House at Dromantine, Newry. In 1998 he came to SMA House, Wilton, Cork. Due to deteriorating health he moved to the St Theresa’s Nursing Unit, Blackrock Road in 2006. David’s remains were removed from the SMA Community Chapel, Blackrock Road, Cork on Sunday, 14 January to St Joseph’s SMA Parish Church, Wilton. His funeral Mass was concelebrated on Monday, 15 January at 12 noon with burial afterwards in the adjoining SMA Community Cemetery. Fr Fachtna O’Driscoll SMA was the main celebrant and was assisted at the altar by SMA priests especially assiociated with David in his missionary apostolate – Fathers Liam O’Callaghan, Joe Maguire, Seamus Nohilly and Bernard Cotter. David’s immediate family all predeceased him, including his sister, Sister Ignatius (Monica) of the Presentation Sisters in Manchester. He is mourned by numerous niecesa and nephews and other relatives. Fr Owen Maginn SMA passed away in the morning of 03 December 2006 at the Mercy Hospital, Cork. He had returned to Ireland from Zambia in 2005 due to ill-health and was being cared for in St Theresa’s Nursing Unit at Blackrock Road for some time until recent deterioration in his condition needed hospitalisation. His condition worsened over the past two weeks and he died peacefully. Owen was born at Seaforde, Downpatrick, Co Down in the Diocese of Down & Connor on 18 October 1920. Having decided very early on in his life to become a missionary priest he began his studies with SMA in 1938 at the Society’s House at Cloughballymore, Kilcolgan, Co Galway. He became a temporary member of SMA on 30 June 1940. In 1940-1944 he continued his programme of studies at SMA House, Dromantine, Co Down. On 12 June 1943 he became a Permanent Member of the Society and was ordained priest on 19 December 1943. Following ordination he studied at the Cambridge University 1944-1946. Subsequently, ill-health forced his hospitalisation 1945-1950. On recovery he was posted to Egypt and taught at St George’s College, Heliopolis 1951-1957. From 1957-1964 he was on the Seminary Staff of the Society’s houses at Cloughballymore and Dromantine. From 1964-1974 he rejoined the teaching staff of St Georgeâ€™s College, Heliopolis, Egypt. In 1974 he was assigned to Ndola Diocese, Zambia. Apart from a sabbatical study year in Rome 1983-1984, he continued to work in Zambia until ill-health forced his retirement to Ireland in 2005. For much of that time in Zambia he was confidential secretary to the Bishop of Ndola until the bishop’s death in 2004. Owen celebrated the Diamond Jubilee of his ordination, 60 years as a priest, in 2003. He is mourned by his sister-in-law, Sadie, his nieces and nephews, his relations and a wide circle of friends. His remains were removed from the Community Church at SMA House, Blackrock Road to SMA Parish Church, Wilton, Cork on Monday 4 December. The Funeral Mass was clelbrated at Wilton on Tuesday, 5 December and was followed by interment in the adjoining Community Cemetery. Fr Fachtna O’Driscoll SMA, Provincial Superior, was the main celebrant of the Mass. He was assisted at the altar by Fr Sean Cahill PP, Castlewellan, Co Down, Fr Willie Cusack SMA, from Blackrock Road and who formerly worked in Zambia, Fr P J Gormley SMA, Dromantine and former Regional Superior in Zambia and Fr Edwin Mulandu from Ndola Diocese, Zambia. The great number of concelebrants included many SMA priests, priests from the Diocese of Down & Connor and the Diocese of Hexham & Newcastle and a representative of the St Patrick’s Missionary Society. Music for the Mass was led by Fr Lee Cahill SMA. Brother Jim Redmond SMA was at the organ. Sr Christine OP from Zambia sang a thanksgiving hymn in Chimemba. The large attendance included Irish Christian Brothers, Missionary Sisters of Our Lady of Apostles, the Mercy Sisters and the Holy Rosary Sisters. Fr Thomas (Tom) Egan SMA passed away in the morning of 3 May 2006 at the South Infirmary, Cork. He had suffered stroke the previous week. His condition deteriorated each day until he died peacefully on Wednesday. Tom was born on 13 August 1925 in Cloonacool, Tubbercurry, Co Sligo in the diocese of Achonry. He received primary education at St Michael’s National School and attended St Nathy’s College, Ballaghadereen and SMA Wilton in Cork for his secondary schooling. He then studied, first, at UCC before graduating from UCG. Having completed his philosphy studies at Cloughballymore, Kilcolgan, Co Galway, he proceded to SMA House, Dromantine, Newry, Co Down for theological studies. He became a permanent member of SMA on 12 June 1950 and was ordained at St Colman’s Cathedral, Newry on 13 June 1951. He was assigned to Liberia for missionary work and his first posting was to Bassa on the difficult Kru Coast, in November 1951. He was later transferred to the Liberian capital, Monrovia, where he spent the remainder of his mission career. In 1964 he was returned to Ireland and began mission promotion work at Blackrock Road. 1965-67 he spent in formation work at the Society’s Spiritual Year Programme at Clouhgballymore, Kilcolgan, Co Galway. He was again engaged on promotion work in Cork 1967-1969. In 1969 he moved to Dublin to spearhead the Society’s promotion work there. He was Superior of the SMA House, Wellington Road, for many years. There he conducted an active apostolate of personal visitation and correspondence with a large circle of our mission helpers and supporters. Failing health forced his retirement in 1998 and he took up residence in St Theresa’s Nursing Unit, Blackrock Road. He suffered a stroke on Wednesday, 26 April and was moved to the South Infirmary, Cork, where he died peacefully in the morning of 3 May. His remains were removed from the Community Chapel at Blackrock Road to the SMA Parish Church, Wilton on Thursday, 4 June . The Funeral Mass will be concelebrated at Wilton on Friday, 5 June at 12 noon and will be followed by burial in the adjoining cemetery. He is sadly mourned by his brother Vincent, by his sisters Kathleen, Anne and Linda, and by his nieces and nephews and other relatives. Fr John Breheny SMA passed away in the morning of 22 April 2006 at St Theresa’s Nursing Unit, SMA House, Blackrock Road, Cork. He had been seriously ill for some months. 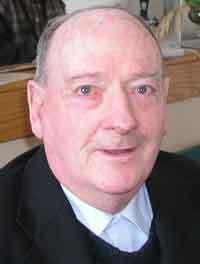 John was born on 10 March 1932 and was a native of Keash, Ballymote, Co Sligo. He was one of the four children of the late Patrick and Mary Breheny. He received primary education at Keash National School and secondary at the Sacred Heart College, Ballinafad, Co Mayo which was run by the SMA. He entered the Society’s Spiritual Year programme at Cloughballymore, Kilcolgan, Co Galway in 1954 and took temporary membership of SMA in 1955. He became a permanent member on 14 June 1960. He was ordained to the priesthood at St Colman’s Cathedral, Newry, Co Down on 21 December 1960. He was assigned to Liberia and worked in the Vicariate of Monrovia from 1961 until 1975. In 1976 he was appointed as assistant pastor at Sacred Heart SMA Parish, Stopsley, Luton where he ministered for the last thirty years. He was diagnosed with serious illness in late 2005. His health rapidly deteriorated and he was forced to come to Cork for treatment early in 2006. He died peacefully on Saturday. Mass was concelebrated at SMA House, Blackrock Road, Cork on Monday, 24 April. The Mass was followed by removal to St Kevin’s Church, Keash, Co Sligo. The Funeral Mass was concelebrated on Tuesday, 25 April and was followed by interment in the family grave at Knockbrack cemetery. Fr John was brother of the late Fr Kevin Breheny SPS. He is survived and mourned by his sisters, Sister Assumpta (Mercy) and Imelda Killoran, by his brother-in-law, Jim, and by his nieces, nephew, relatives and friends. A great crowd of sympathisers gathered for the funeral service including a substantial number of parishioners from Sacred Heart Parish, Stopsley, Luton where Fr John was highly esteemed. Fr Joseph (Joe) Brennan SMA passed away peacefully in the afternoon of 01 March 2006 at St Theresa’s Nursing Unit, SMA House, Blackrock Road, Cork. He had been unwell for a number of years but was in good form up to the previous day. Joe was born on 15 November 1925 in Newcastle-on-Tyne in the Diocese of Hexham & Newcastle in England. He was an only child and both his parents died when Joe was very young, his father having been killed in a mining accident. Joe was reared by his aunt. As a youth he spent some time as a miner and came to Castlecomer to work in the mines there. He also spent some time in the Irish Army. Finding a need for another kind of service, Joe came to the SMA in 1952 to the Society’s Noviciate at Cloughballymore, Kilcolgan, Co Galway and became a temporary member of SMA on 14 June 1954. He continued his studies of theology at Dromantine, Newry, Co Down and became a permanent member on 12 June 1957. He was ordained to the priesthood on the 18th June 1958 at St Colman’s Cathedral, Newry. His first appointment was to the Diocese of Jos and he ministered there until 1977, serving in various parishes of the Diocese. His first experience of illness brought him back to Europe and he worked in the Diocese of Leeds 1977-1986. He then spent 1986-1989 in Castlecomer. From 1989 to 1992 he was on assignment in the Diocese of Hexham & Newcastle. Due to deteriorating health conditions he was forced to retire to Dromantine in 1992, to Wilton in 1998 and finally to Blackrock Road in 2002. Fr Joe is mourned by various cousins from America, England and Ireland as well as many friends and former parishioners. On Thursday, 2 March, his remains were removed to the SMA Parish Church, Wilton. The funeral Mass was concelebrated at Wilton SMA Parish Church on Friday, 3 March. The Provincial Superior, Fr Fachtna O’Driscoll SMA, was the main concelebrant and preached the homily. He was joined at the altar by Fathers Sean Hayes (Joe’s classmate), Sean Lynch (representing the Blackrock Road community), Fionnbarra O Cuilleanain and Bernard Cotter (both worked alongside Joe in Jos Diocese). Fr Joe was then laid to rest in the adjoining SMA cemetery. Fr James G (Jim) Lee SMA passed away peacefully on the morning of 20 February 2006 at St Theresa’s Nursing Unit, SMA House, Blackrock Road, Cork. He had returned from Liberia in September for medical treatment for a tumour. Jim was born on 29 April 1924 in Belfast and was a native of Dunturk near Dromaroad, Co Down. He was the eldest of the five children of Patrick and Mary Lee. Having completed his secondary schooling he decided to become a priest. He was strongly influenced by the then Parish Priest of Dromaroad, Canon Cahill, who was a brother of Fr Thomas Sexton Cahill SMA who had died in 1942. He encouraged Jim to become a missionary priest when he expressed interest in priesthood. So he joined SMA in 1946 and studied at the Society’s houses in Galway and Dromantine until 1952. He became a permanent member of SMA on 11 June 1951 and was ordained to the priesthood on 18 June 1952 at St Colman’s Cathedral, Newry, Co Down. He was assigned to the Archdiocese of Lagos, Nigeria and served there until 1957. From 1957 to 1962 he was Provincial Secretary. He then returned to Nigeria for ten more years. Most of his time in Nigeria was spent teaching at St Leo’s Teacher Training College, Abeokuta. In 1972 he went on assignment to Northampton diocese in England. Then, in 1976, he went to Monrovia, Liberia where he ministered until September 2005. Jim was involved in the pastoral and social development areas and for many years was Administrative Assistant to the Archbishop of Monrovia which included responsibility for the finances of the Archdiocese. He was in Liberia throughout the 15 year-long civil war. He was there under the civilian government of President Tolbert and the military rule of Samuel Doe, Prince Johnson and Charles Taylor. He was overjoyed to see civilian rule restored and Liberia’s first woman president inaugurated last month. His long years of service in humanitarian assistance to Liberia were recognised in 2004 when Jim was admitted to the Humane Order of African Redemption by the Government of Liberia with a grade of Knight Great Band, Liberia’s highest honour and Africa’s oldest. His brother Patrick in 1991 and his sister Mary Fodey in 2004 predeceased him. He is survived by his sisters Lucy Kirkpatrick and Margaret Cassidy and by many nieces and nephews and other relatives and a host of friends. He is particularly mourned by Archbishop Michael Francis, by the Apostolic Administrator, Fr Karnley, and by the priests and people of the Archdiocese of Monrovia. The funeral Mass was concelebrated at Wilton SMA Parish Church on Wednesday, 22 February and was followed by burial in the adjoining SMA cemetery. Fr Fachta O’Driscoll SMA, Provincial Superior was the main celebrant and preached the homily. It is with great sadness that the SMA announces the sudden death of Fr Fergus Conlan SMA. He died in his residence in the SMA Regional House, Ndola, Zambia on the morning of Tuesday, 17 January 2006. Though he had a multiple heart by-pass in 1994, his death was unexpected. Fergus was the SMA Regional Superior in Zambia. Son of the late Peter and Mary Conlan, Fergus was a native of Barr, Donaghmore Parish, near Newry, Co Down. He was born on 19 October 1939. He was brother to Sister Ita, Sisters of the Cross (Cameroon) and to Aidan, Kieran and the late Finbarr Conlan. Having completed his secondary education at the Abbey CBS, Newry, he decided he wanted to be a missionary and came to the undertake a Spiritual Year at the SMA House, Cloughballymore, Co Galway in 1957. In 1958 he was based at the SMA House, Wilton and studied at University College, Cork where he graduated with a BSc in 1961. His theology studies were at the SMA Major Seminary, Dromantine, Newry, which was located in his native parish, from 1961-1965. During his time there he was an accomplished sportsman, excelling in most sports. Fergus became a temporary member of the Society of African Missions on 25 June 1958 and a permanent member on 16 June 1964. Fergus was ordained in on 16 December 1964 and was first assigned to Ondo Diocese, Nigeria. In 1968 he was Director of students in Sacred Heart SMA College, Ballinafad, Co Mayo. In 1969 he studied Youth Guidance in Birmingham, England. In 1970 he was on Promotion work in Ireland, based at Dromantine. He returned to Ondo Diocese in 1971 and ministered there until 1980. He was engaged in Vocations Recruitment at Dromantine from 1981 until 1983. In 1983 went for further studies to Boston College, USA, graduating with an MA in Counselling in 1985. Since 1986 he has ministered in Ndola Diocese, Zambia. In 2001 he was elected SMA Regional Superior in Zambia. The funeral Mass was concelebrated at the Dominican Convent Chapel, Fatima, Francisdale in Zambia on Monday, 23 January. Interment followed in Francisdale Cemetery. We invite all our readers to remember him and his family in prayer. Fr Con O’Driscoll SMA was a native of Aughadown, Skibbereen, Co Cork in the Diocese of Ross where he was born on 10 January 1923. His family home was later at Oakfield Lawn, Ballinlough, Cork City. He studied at the SMA houses at Cloughballymore, Kilcolgan, Co Galway and at Dromantine, Newry, Co Down and became a member of the Society of African Missions on 1 July 1945. He was ordained priest at St Colman’s Cathedral, Newry on 14 June 1949. Appointed to Nigeria he was assigned to the Apostolic Vicariate of Asaba-Benin 1949-1953 and served in various parts of that region during the subsequent expansion of the Church there: 1954-1964 in Benin City Diocese and 1964-1973 in Warri Diocese. He was Vicar-General of Warri Diocese 1964-1969. In 1973-1975 he was assigned to the Society’s Ballinafad College in Co Mayo. From 1976 to 1981 he worked in Clifton Diocese in England. He was then seconded to the British Province of SMA and ministered in SMA Parish, West Green, London 1981-2001. In 2001 he retired to SMA House, Blackrock Road, Cork. , collapsed and passed away immediately. Fr O’Driscoll is surviced and mourned by his sisters-in-law, many nieces and nephews including Fr Michael Waters SMA (Kontagora, Nigeria) and Fr Michael O’Driscoll of the Dioceses of Cork and Ross, succeeding generations of relatives and a wide circle of friends. Fr Dan Cashman SMA (who served with Fr Con in Warri Diocese), classmate Fr Patrick Jennings SMA, and British SMA Provincial Superior Fr Tom Ryan SMA. There were numerous other concelebrants representing the local Dioceses (Cork & Ross and Cloyne), Augustinians and confreres from SMA. Members of Cois Tine and the Knights of Columbanus provided guards of honour. Following the final commendation Fr Con’s favourite song “Skibbereen” was sung at the graveside. Fr Dan Daly SMA was born in Caherhayes, Abbeyfeale, Co Limerick on 28 December 1909. Deciding to become a missionary priest he commenced his studies at St Joseph’s SMA College, Wilton, Cork and he became a permanent member of SMA on 19 June 1937. He completed his studies for the priesthood at SMA College, Dromantine, Newry, Co Down and was ordained priest on 19 December 1937 in St Colman’s Cathedral, Newry. Following the completion of his studies in 1938 he was assigned as a missionary to Nigeria, to the Vicariate of Lagos. He worked there for the next 31 years in various pastoral assignments until forced to return to Ireland in 1969 due to ill-health. Though ill-health continued to give him trouble he was involved in promotion work at Blackrock Road from 1970-1978. Since 1979 he has been living in retirement at SMA House, Blackrock Road, Cork and more recently at the St Theresa’s Nursing Unit attached to the house. He died there peacefully in the afternoon of 12 July at the age of 95 years. At the time of his death he was the oldest member of the Irish Province of SMA. the homily. He was joined by a representative of the Columban Missionaries and of the Capuchin Franciscans and a large body of SMA confreres. The Funeral was attended by many of Fr Dan’s relations and friends, parishioners from Abbeyfeale, members of the Marian Movement for Priests, Sisters of Mercy and Missionary Sisters of Our Lady of Apostles. Brother Jim Redmond SMA was at the organ and Fr Cormac Breathnach SMA led the singing for the Mass.